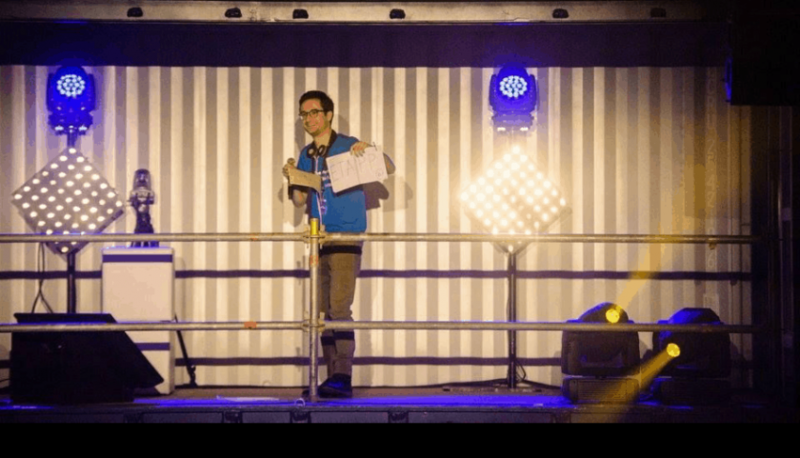 To address the digital challenges of the maritime and logistics industry in Antwerp, the port-hackathon “Logistics of the Future” took place in December of 2016. During the event, more than 200 participants – twice the number of participants of the World Port Hackathon 2016 in Rotterdam – from Belgium, Singapore, Mexico, Russia and Israel worked non-stop to find solutions for the Port of Antwerp. The prize: a 5000 euro prototyping budget. This is part 2 of my post, describing the conclusion of the Hackathon event. The initial intention of my personal participation was covered in part 1. Saturday morning at a quarter to 8 I get up from my bunk bed and head for the showers. There is no hot water and because of the cold splash I am wide awake instantly. A lavish breakfast is displayed on the tables in the event hall. Next to our team table Pieter is still sleeping. At a table nearby someone is typing away frantically on his laptop, headphones plugged in. He has been working all night – something which he will be doing the night after as well. Before the rest of the team arrives, I grab a few markers to make a schematic on our flip chart. I draw an illustration of the specific pains that I feel in my daily experience with the bill of lading. These are problems that affect our customers just the same. As the team gradually joins the table, questions are raised. How are customs involved in this process? When are the transporters notified at the destination side? Can communications with those partners be optimized too? Procedures and information flows are sketched by several members of the team. Possible side tracks begin to multiply and I try my best to maintain focus within our team. At the same time I am amazed by the conviction of our group and the speed in which they manage to translate the complex subject matter into models and diagrams. By late afternoon, decisions are made on what needs to stay and what has to go. Jeroen, Ramses and Pieter retreat to their separate corners where they design the pages for the platform from behind their computers. The rudimentary self-made logo that I had proposed to use has been reworked and suddenly looks very professional. On Sunday morning Evert and I manage to add a business model to our Powerpoint, with a bit of help from our coach Avantida. The presentation we give in front of the jury panel is a success. After that, we wait to hear if we make it to the final selection. Right before the announcement, the event sponsors are called onstage to address the audience. Tine Vandenbreeden, COO at SAP, recalls my passionate plea during the opening night. I thank her for the honorable mention. But sadly our team does not make the final cut. For a moment we feel disappointed. A person in our team points out how the jury consisted of sponsors mainly. It seems obvious that projects get selected based on whether or not they showcase any of their products. This is understandable and perhaps even the reality of contests such as these. We say goodbye to our fellow team players and thank each other for the collaborative effort. After 48 hours I exit the event, tired but satisfied.